Are you ready for more Tom "durrrr" Dwan on "Poker After Dark"? How about some Phil Galfond as well? For the first time in roughly a decade, Pot Limit Omaha will be the featured game on "Poker After Dark" this week. Three days of $300/$600 Pot Limit Omaha cash games will be featured on the show this week, starting on Tuesday (September 26th) and running until Thursday (September 28th). The line-up will be filled with big names, as Tom "durrrr" Dwan is set to return to the show. Dwan returned to "Poker After Dark" this past summer, with his most notable hand coming in an Aces vs Kings confrontation against Antonio Esfandiari (Dwan won). Dwan's appearance on the show generated a tremendous amount of buzz, and the producers of "Poker After Dark" were eager to get him back on as soon as possible. 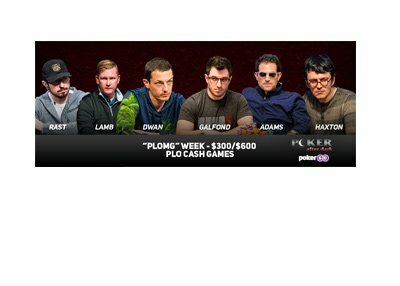 Along with Tom Dwan, Phil Galfond (aka "OMGClayAken", aka "MrSweets28") will also be headlining "PLOMG" week. Galfond is a busy man, as he has multiple ventures on the go right now, though he will find the time in his schedule to sit down for three straight days of $300/$600 PLO cash game action this week. A few notes: Phil Galfond has a Pot Limit Omaha World Series of Poker bracelet, while Brandon Adams is coming off of a recent win in a $50,000 "Poker Masters" prelim event. The action gets underway Tuesday, September 26th, 2017 at 8:00 pm EST on "PokerGo". The cash games will be hosted by the ARIA Resort & Casino in Las Vegas, Nevada.